Telling a story is as much about what isn't included as it is about what is included. It's easy to overwhelm with too much: Too much story, too many people, too much detail. Artful brevity, careful selection is key to how a story is told and perceived. As much as novels, movies, television struggle with this concept, video games must doubly so because typically a video game's narrative is a cooperative effort. It is a by-product of how a game is laid out and how it is played out. A fine balance has to be struck to chart a course for a player without making them feel like they are more audience than participant. But allow too much freedom and any semblance of story arc, character growth and message is lost in the vagaries of a player's inattention to what the game's creators think should matter to the character they play. The perfect balance is achieved by subtly convincing the player to become the character they control. The player as actor is the only way video games can tell meaningful stories. That's why Uncharted 3: Drake's Deception feels like such a powerful experience. In this, Nathan Drake's third video game outing, players take on the role of both a Drake accustomed to his dangerous, globe-trotting adventures, and a young Drake first coming into his own as a treasure hunter. The game's artful flashback, telling how Victor Sullivan and Drake became friends, deepens the ties between those two characters and draws out the emotions players might feel as they pick their way through the game's robust plot. 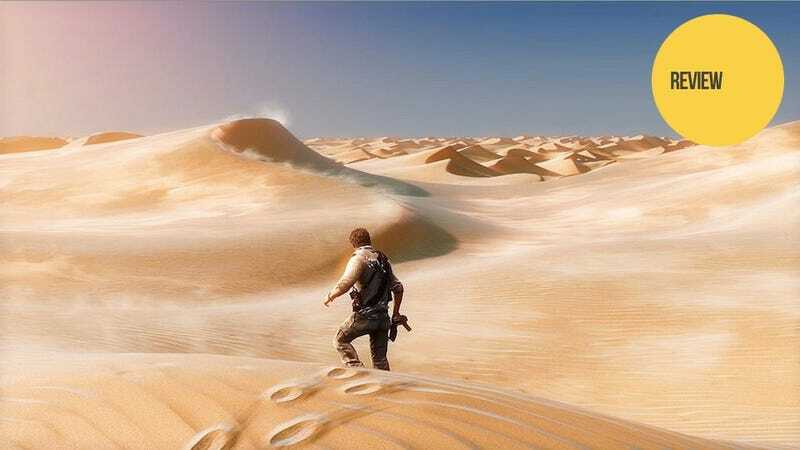 This time around, Drake finds himself pitted against a shadowy global organization as he hunts for a mysterious treasure in the Rub' al Khali desert. The treasure is said to be in the heart of the lost city of Iram of the Pillars. As with previous games, Uncharted 3 draws from history, mythology and sweeping landscapes to create a backdrop and story meant to tug players through a series of stunning set pieces, ancient puzzles and bursts of firefights. The game's jet-setting opens the door to some colorful scenery. It also does a deft job of including other support characters that help to flesh out the cast and depth of the game. While the game is a puzzle-packed action adventure that leans heavily on both sneaking and shooting, it leaves the door open a bit for players to choose how to approach most challenges. Early on in Uncharted 3 I started to worry about how many times I was pulling the trigger as the game's quirky, accidentally heroic Drake. It didn't feel right because Drake didn't strike me as the kind of guy who would gun down a dozen nameless thugs one minute and then joke with his mentor or love interest the next. So I tried to stop shooting people. I started sneaking through the game's deserts, villages and underground, carefully picking my way around armed guards. When confronted with overwhelming odds, I simply ran away. Occasionally I'd resort to a firefight, but only when Drake was cornered and there was no other way out. Drake's character and mannerisms, not some written code of conduct or ethics, were guiding my decisions. I played knowing that I could easily derail the experience whenever I wanted to. I could stop fighting and refuse to proceed through a conflict entirely. I could run away from the task at hand. But I never wanted to because the cast of characters, their relationships, the story and the myriad of settings were so compelling I didn't want to. Uncharted 3 is the video game equivalent of a page-turner, only you're working with the game's creators to tell that story. This isn't new for video games, but Uncharted 3 seems to do this better most. It does it foremost by making you see Drake as not just a collection of animations, or a faceless surrogate to your own actions and decisions, but as a fleshed out character. Drake tugs at his shirt, he swats bugs in the air, rubs the back of his neck when he walks. If he gets too close to a wall as you maneuver him, he'll brush his hands on it and push off a little. When he jumps for a ledge, he sometimes scrambles. He exclaims painfully when he dies. He screams. He shouts. He trips. Drake is an imperfect creation, who sometimes rails against a player's imperfect control over him. Journeying through the game's 22 chapters, players see more of Drake's weaknesses then they have in the past. They may also see more of the frayed edges of a series that sometimes tries to do too much. Enemies begin to look a bit too alike, so much so that it becomes distracting. The animations, so clever in showing a jarring, tooth-and-nail fist fight, begin to repeat as well. Noticing these little things are at most distracting from the game's overall satisfying experience. Uncharted 3's story is so powerful, so enjoyable that I almost regret dropping into the game's multiplayer. This latest take on playing online in the world of Uncharted has improved over Uncharted 2's multiplayer, but not by much. I think that's because the best bits of Uncharted don't involve gunplay, so when you strip everything but the gunplay away, you're left missing that more pure experience. The cooperative play, especially the collection of campaign-driven missions you can play with friends, is well worth the time. Playing with a buddy in the game's coop challenges can also be fun. But this is the sort of game that I play through and then put away on a shelf, like an old copy of White Fang. I have never exclaimed, laughed, talked to a game so much as I have while playing this latest Uncharted. I feel a sense of accomplishment having completed it. It's satisfying to stand back in this world and see what you, through Drake, have accomplished. And there are plenty of places to do that. Wandering through the wind-blown dunes of the Rub' al Khali, I stopped to look up at the glimmering city of stars that stretch out in every direction. In Yemen, walking to my next discovery, I fell behind my friends while marveling at the village and its people: Splashes of color under a dazzling blue sky. These quiet moments, chances to discover not treasure, nor challenges, but natural wonder, are as much a reason to love Uncharted 3 as any spectacle of gunplay or explosion, lost city or plane crash. It's equally satisfying, having finished the game, to spend some time remembering it. Uncharted paints so vivid an adventure, and peoples it with a cast you so come to care for, that it's hard to shake loose from those memories. That's the sign of a game well made and well played. Uncharted 3: Drake's Deception was released on Nov. 1 for the Playstation 3. SCEA provided Kotaku with a copy of the game. I played through the game's campaign, most of the cooperative missions and for several hours with online competitive modes.